P. praecocius Hitch. & Chase, Rhodora, 8: 206. 1906. Culms 6-18' tall, slender, branching almost at once, the secondary panicles appearing before the primary ones are mature, strongly pubescent with long weak spreading hairs over 1 1/2" long; sheaths similarly pubescent; ligule 1 1/2"-2" long; blades 1V-3' long, 2"- 3 1/2" wide, lanceolate, hirsute with long hairs on both surfaces, the hairs on the upper surface erect and over 2" long; primary panicle 1 1/2'-2 1/2' long and about as wide, its branches spreading or ascending; spikelets a little less than 1" long, obovoid, pubescent with long weak spreading hairs, the first scale 1/2 as long as the spikelet or a little less. Dry places, Michigan to Texas. June-Aug.
P. implicatum Scribn. ; Nash, in Britt. & Br. 111. Fl. 3: 498. 1898. Culms tufted, erect, 10'-22' tall, very slender, more or less pubescent, at length much branched. Sheaths shorter than the internodes, densely papillose-hirsute, at least the lower ones; ligule a ring of long hairs; blades erect, lanceolate, 1/2'-2 1/2' long, 1 "-3" wide, at least the lower ones papillose-hirsute on both surfaces, especially beneath; panicle open, ovate, 1'-2 1/4' long, hirsute, its branches widely spreading; spikelets broadly obovate, obtuse, purplish, about \" long, the outer 3 scales pubescent with short spreading hairs, the first scale nearly one-half as long as the spikelet, broadly ovate, obtuse, i-nerved, the second and third scales orbicular-oval, 7-nerved. Dry soil, Nova Scotia to Minnesota, District of Columbia and Kentucky. 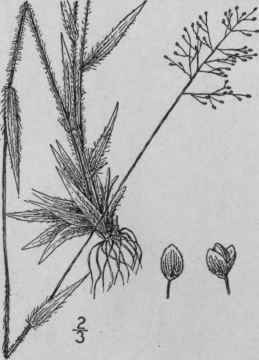 Panicum meridionale Ashe, Journ. E. Mitch. Sci. Soc. 59. 1898. Not Hack. 1895. Panicum subvillosum Ashe, loc. cit. 16: 86. 1900. tPanicum albemarlense Ashe, loc. cit. 84. 1900. 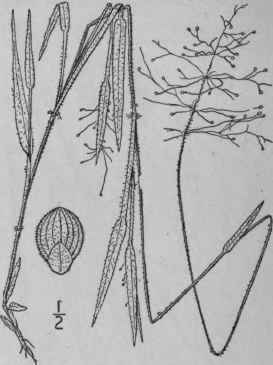 Panicum oricola Hitchc. & Chase, Rhodora, 8: 208. Culms densely tufted, 4'-16' tall, later much-branched and often decumbent and forming mats, hirsute below with ascending or nearly erect hairs, the upper part of the culm puberulent; sheaths hirsute with ascending or somewhat spreading hairs; ligule commonly over 1" long; blades 3/4-3' long, 1-3" wide, erect or nearly so, lanceolate, the upper surface with erect hairs over 1 1/2" long, or sometimes nearly glabrous, the lower surface appressed-pubescent with shorter hairs; panicle up to 2' long, the axis puberulent or very shortly pilose, the branches spreading or ascending; spikelets from a little less than 3/4" to nearly 1" long, pubescent. Sandy places. Nova Scotia to Minnesota, Georgia and Missouri. June and July.